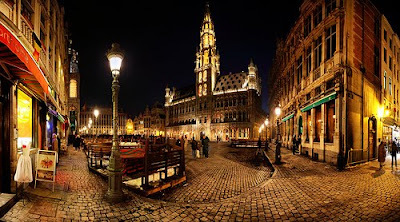 there and back, belgium was certainly more than what me had bargained for in more ways than one. for all the good, bad, happy and sad, well, guess it was all part of the package. it would not be what it was, if there was anything less. belgian waffles, check, and on an unusually entertaining boat ride to boot. belgian chocolates, check, of which even got my hands dirty, lovingly of course, with the enticing aroma of chocolate whilst on a crash course apprenticeship with a famous chocolatier. belgian mussels, check, salted as can be, in a little pot. belgian friedkot, check, fresh out of artery clogging beef oil, in a traditional paper cone, alongside tonnes of flavorful sauces, and sinfully yummilicious. belgian ice tea, lipton no less, of which tried the lemon and peach flavors, and well, it was something rather unique, and simply delectable with the fizz to make it sparklingly refreshing. on hindsight, sounds like all that has been mentioned so far has to do with the eats and drink. so in short, really, food, glorious food. it was nothing short of being a sanctuary, with the scenary to boot, beautifully picturesque in its seamless blend of something new and something old. loved the streets of old cobbles though they were bloody painful to walk on when on anything higher than ground level, and the broken stiletto heels in my suitcase are proof of that. much rather be on nice flat soles that do not go round crippling the feet, pity work is work and flats are out of the question unless stated otherwise by wardrobe. there was a lovely ring to the clippety clop of the heels against the cobbles though, and somehow made me feel a little like a horse. so many places, a sea of faces. soaking in the sights and sounds as if there was no tomorrow was the game of day everyday whilst trying to get by making it through each day. each did get more difficult than the last, unbelievably unexpected, but true, especially with all that went on. belgium reminded me of my not so faraway european nest, and a sweet housemommy who was missed very dearly, and so had dropped her a text to say a little hi and to tell her she was missed. pity there was no time in between shooting to do much else, or would probably have been tempted to hop on a plane or boat or bus or whatever would have taken me there for a good old fashioned hug to tell her that much. so little time, so much to do. though belgium was not my city of dreams, it was nonetheless irrevocably a place no less beautiful for all it was worth, and a temporary utopia for what and when little it could be. au revoir belgium, thank you for the magical spell of enchantment you casted in your seductive street lights, charming cafes, lonely lanes, and alluring air, even if it was short lived, and very much just that of one moment in time of ineffable affinity.